BRISTOL, Tenn. (AP) — NASCAR’s second stop at a short track this season is yet another race that’s impossible to predict. There’s a new rules package, a traction strip around Bristol Motor Speedway and the general crankiness that short-track racing tends to produce. Moods were mixed following Saturday’s final practice and defending race winner Kyle Busch was less than pleased with how conditions are coming together. He was the fastest Toyota driver of the session, fifth overall, but got prickly when asked how he expected Sunday’s race to go under NASCAR’s high-downforce rules package. NASCAR raced two weeks ago at Martinsville Speedway, the shortest track on the NASCAR circuit at 0.526 mile, and a track that typically forces drivers to gouge their way through the field. But the race did not live up to expectations and Brad Keselowski won in a runaway — he led all but 54 laps and was passed on the track only by Chase Elliott. Busch warned that Bristol might be much of the same because of a rules package that emphasizes high downforce — one he’s been dubious about since NASCAR said last year it was making radical changes. “That’s exactly what we told everybody,” he said with a smirk. Joey Logano cautioned that Bristol’s 0.533-mile, high-banked, all-concrete bullring is so different from the paperclip layout at Martinsville, that it would take an effort such as Keselowski’s to repeat that race. Keselowski’s strong Ford had clean air down the long straightaways and into the flat, narrow turns, and that contributed to the underwhelming race. “You get a good car up front that can control the pace, especially at a place like Martinsville … if you get lead you get more air cooling your brakes, you can run the pace that you want to and you have everything cooler than the guy that was chasing you the whole time and you’re able to drive away,” he said. 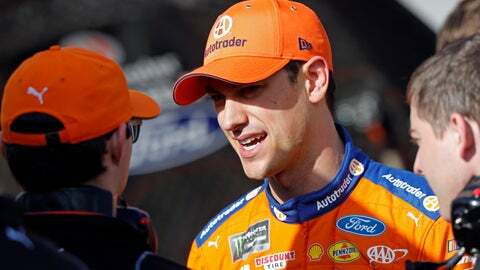 Logano doesn’t believe the leader at Bristol will be able to pull away the same way Keselowski did at Martinsville. Drivers also have to figure out the traction compound applied to the bottom of the Bristol track that makes for a stickier second lane. The PJ1 traction keeps drivers in the low lane until it wears away or another driver is bold enough to venture up the high banking into the top lane. Kyle Larson is typically the leader in taking that gamble, while conservative teams run along the bottom until the traction has been worn off. Jimmie Johnson was the second fastest in the final practice — quickest of the winless Chevrolet camp — and said warmer temperatures Sunday or a long green-flag run will have drivers following Larson up to the lane early. Johnson and his Hendrick Motorsports teammates, aside from Chase Elliott, have been struggling as Chevrolet in its second season with the Camaro still has not caught its competitors. Elliott and William Byron gave Hendrick the front row in Bristol qualifying, and Johnson found some late speed that improved his confidence about his car. Through seven races, Toyota has four wins, Ford has three and the Chevy camp is still lagging. Elliott’s victory at Kansas last October was the most recent for a Chevy driver, and that was only one of four victories all season for the Camaro. Elliott, who starts from the pole at a short track for the first time in his career, likes his chances Sunday because his second-place finish at Martinsville was his best of the season. He led 49 laps. He is encouraged by improvements within Hendrick and not worried about what could be a larger Chevrolet problem. “I think blaming the manufacturer is the wrong route to go, and certainly isn’t productive. I think the more you sit back, and do your job and make the most of whatever you have, the better results you are going to have,” Elliott said. Austin Dillon, leader of Richard Childress Racing and winner of last year’s Daytona 500, said all facets are still rebuilding and working on stronger footing.